Are you interested in working out? Well, shoes are an essential part of doing so. Crossfit shoes are the best you can have as they give your body the ultimate balance you need to move around at the gym. There are various factors to consider when you are looking to purchase a pair of crossfit shoes. You should look for ones with a low profile that makes the heel lower than the toe. Another desirable feature would be a wide toe box that allows you to distribute your weight and toes. A lightweight shoe is preferable because it helps you reduce your weight load. Crossfit shoes should be made of durable and strong materials that won’t tear easily, giving you a great service over a long period of time. Equipping yourself with the best shoes would make your workouts more fun and enjoyable. Putting the above into consideration, we went through some of the best Crossfit shoes for men and selected our top picks. The most popular Reebok Nano shoe gets the best marks for its comfort and stability. The stability and grip of the toe and heel make it a great shoe for doing burpees and climbing ropes. The Reebok Nano has a DuPont Kevlar infused mesh that guarantees durable ventilation keeping your feet comfortable. In addition, they have an extremely durable Kevlar patch feature. This guarantees protection from ropes when climbing thus their durability is assured. Kevlar is the stuff used in bicycles tires, racing sails and body armor which theoretically makes these shoes stronger than steel. These shoes are basically an extension of your feet and blocks of rubber hindering your movement and progress. A compression – molded midsole supports shock absorption, which is for aerobic activities. The Nano 6.0 brings a multi-functional frame, in general, making it one of lightest crossfit shoes. Like most crossfit shoes, the Reebok Nano are stiff which makes them perfect for crossfit activities, squatting, running or lifting. The shoes come with a removable insole. They also come in excess of twenty colors and provide incredible grip and traction. The Nano 6.0 will surely give you the best while providing extra safety and making workout sessions more enjoyable. The Nike Metcon 3 is a great option for men who consider themselves serious crossfitters. Whether it is climbing, lifting, flexing, sprinting, or jumping, this shoe can take anything thrown at it. The Metcon harbors a firm heel, softer forefoot, tacky rubber for traction, and a sole that extends up the arch. All these features serve to provide stability and enough cushioning for running and jumping. 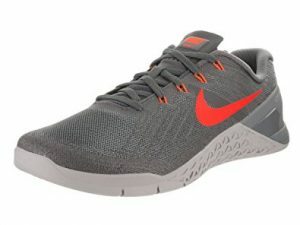 The design of the Metcon 3 enhances performance during wall exercises. The midsole is softer, giving the user a great delivery of resilience for sprints or cardio. Its midfoot area is also enclosed with textured rubber to buttress rope climbing and durability. This combo of a powerful platform and rubber heel make the shoe more balanced for lifting sessions. The Nike Metcon also has a heel mesh feature that enables you to stay cool. This shoe is stylish, lightweight, and supportive which will keep you moving seamlessly through your workouts. 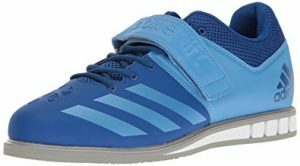 The Adidas Powerlift shoe has the same quality features as the other high-quality crossfit shoes but with a lower price tag. This shoe has a low profile and a firm heel that offers the stability and support that you need especially if you are into weightlifting. The Adidas Powerlift also has an extra wide toe box, giving your feet plenty of room to maneuver which in turn counts for optimal performance. The build of the shoe incorporates just the right amount of balance to complement performance in powerlifting and circuit training. The shoe has a featherweight chassis that comprises an injected polymer for a more balanced build. The VentFlow slits cater for enough airing and the rubber outsole covering that prevents the shoe from sliding under most moderate circumstances. The more adjustable midsole reinforcement leash adds stability providing for a perfect foothold lifting. The Adidas Powerlift also features an insole that gives one a good grip on the floor to help maintain balance and posture. In addition, the removable insoles ensure a comfortable fit for whatever preference you may have. There is also an extra wide design for a functional fit. While they are known for running, Asics have hit it out with this Conviction shoe for Crossfitters. This shoe is lightweight, with a minimal heel to toe drop and a flat, sturdy heel for stability. The Asics Conviction is arguably one of the lightest cross-training shoe available in the market. Its midsole technology offers excellent flexibility, cushioning, shock absorption, and durability. The rubber insole makes the shoe feel comfortable and helps absorb any shock. This shoe also comes with a SpEVA midsole technology that augments several lifting and aerobic activities. This makes it a brilliant Crossfit shoe. These features combined with a sticky sole, make it an excellent shoe for heavy lifting. The upper is made of a seamless, abrasion-resistant synthetic leather that helps in the shoe’s durability from rough workouts. The shoes also feature a perforated sock liner for increased breathability and excellent moisture – wicking abilities. The Asics Conviction is slim with a 7mm and a 4mm forefoot elevation making it lightweight. 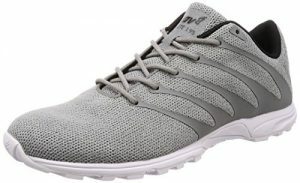 The flexibility of the Invo-8 F-Lite 195 shoes makes them a nice, comfortable choice for running as well as jumping and sprinting. They are ultra- lightweight and feature just a 3mm heel to toe drop, so you are closer to the ground for more power. The lighter build of the shoe (11.72oz) will allow you to put in the ultimate performance with less effort. The Crossfit is all about keeping oneself fit through the element of surprise; this being a balanced shoe helps you enjoy all sorts of training exercises. It comes with a rubber sole for shock absorption. Besides, it has an EVA foam midsole for a cushiony comfort. With the Rope-Tec, burn reinforcements, you will feel fine even during extended sessions. They also have a sticky rubber sole with indentations for grip and traction, especially when climbing or running. The wide toe box makes them a solid choice for men with wide feet. Though it might seem overwhelming purchasing the best crossfit shoes, given the right information, a buyer can make the right decision. 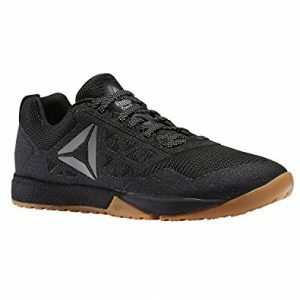 Here are some tips to help you when shopping for the best crossfit shoes for men. Comfort is key for any shoes regardless of the activity it will perform. Crossfit shoes are a bit different from normal ones. Crossfit experts prefer wide toe box shoes such as the Nike Metcon 3 as this would allow your toes to splay comfortably during lifts and jumps. The hallmarks of a comfortable crossfit shoe include soft insole flexible shape and breathable material. Breathability of crossfit shoes is essential as it ensures that all the heat produced during exercise is removed which will reduce irritation. Additionally, it serves to reduce the “wiggling” effect that is produced when there is an excess accumulation of heat between the feet and the inner sole. Crossfit shoes are supposed to be tough and stable to give a great experience. It is vital to keep up a firm, balanced grip on the floor, or the lifters will be susceptible to slipping which might lead to injury. The lack of stability in a shoe might lead to undesirable effects and swings. Crossfit footwear should also enable you to maintain a stable posture as you train. Crossfit shoes are used in high-intensity workouts. Rope climbing and handstand-pushups make different parts of the shoes highly susceptible to wear and tear. It’s therefore important to find long-lasting shoes that won’t require replacement after a short while. The durability of a shoe will depend on materials that are going to endure due to the high-intensity training. While the heavy materials are not required, the short-life materials are not required either. The technologies assimilated into the shoes should also be long-lasting. All types of training shoes are lightweight. This includes running, football, cycling, and crossfit shoes. Crossfit shoes for men tend to be a bit heavier than women’s shoes. Super lightweight shoes such as the Asics Conviction improve most aspects of training and reduce the effort required to train. The synthetic substance used to build these shoes is not only stronger but also long lasting than rubber. This refers to the difference between how high the heel is and how high the forefoot is. 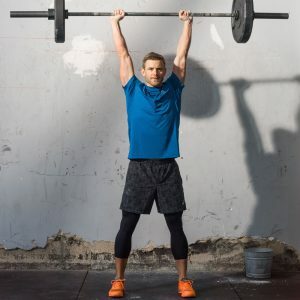 For weightlifters, they prefer to have the heels much higher as it helps in their training rather than them feeling like they are on the ground. A medium drop is considered to be around 4mm which provides an even distribution of weight. This is essential for Crossfit shoes. With a huge variety of exercises that are common with crossfit, your shoes are vulnerable to wear and tear. This underlined the need to purchase shoes with quality materials. Crossfit shoes need to be strong on the outside such as the Kevlar material that brings in some grip making climbing easier. This is also great, as quality shoes will protect you if you were to be involved in an accident. What you intend to use the shoe for is paramount when choosing a Crossfit shoe. Some shoes are specific to Crossfit exercises while others are more general in their use. The more all-rounder shoe is appropriate for those partaking in additional activities such as different classes at the gym. 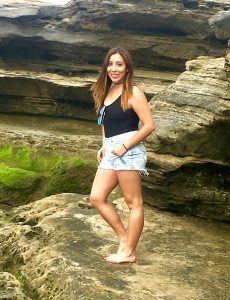 Color should not be the main factor when choosing crossfit shoes, but you can’t deny that it is an influencing aspect of how you like something. Great colors that match your workout outfits may be a great pick for that fashionable look at the gym. You may also need to rock your shoe in your daily errands after work and look great at the same time. Many Crossfit shoes are available in different awesome colors to suit your preference and taste. Your training regime needs to be considered while you are shopping for crossfit shoes. How regularly you work out in a week will directly affect the longevity of the shoe. Thus an appropriate choice is very important. You should also not be afraid to ask questions when buying crossfit footwear. Buying the wrong shoe size may prove to be an unwanted experience. This is particularly true if you are planning to go into a high-intensity workout program. It is equally important to consider the shoe material as this is a vital factor in deciding your shoe’s lifespan. Staying comfortable while working out should be your top deciding factor when choosing a crossfit shoe.